Hulu TV – 2 weeks FREE! In early 2019 Hulu was named the fastest growing live tv streaming service over YouTube TV. Try two weeks of Hulu for free, on me! The first step in this process is to figure out what HDTV antenna you need. I’m going to walk you through the steps I used to replace my DirecTV with an outdoor HDTV antenna. You can also use a Mohu amplified indoor antenna to capture HDTV channels from inside your house for one TV. By using an external or outdoor HD antenna it should give you signal in every room that has a coaxial outlet. DirecTV is different from basic cable because you need a box for every TV. If you had basic cable you should get HDTV in every room that had cable. First thing is first, you need to see what channels are available in your area. Head over to the TV Fool to use their HDTV signal detector. To enter your address, click the large “Click Here” in the middle of the page and you should be directed to a page where you can enter your address. If you will use an outdoor attic installation for your HDTV, you can also enter the height at which your antenna will be placed. The TV Fool tool will help you inform the range of HDTV antenna you’ll need. 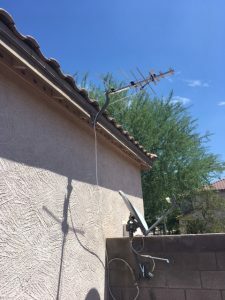 The best approach, in my opinion, is to install your antenna close to your DirecTV dish since you know that is the line into the house and because of that, you know the signal will get to every room. Using the instructions that came with your antenna, find a safe location to install it on your house or roof. You should always be mindful of any large objects that might be on the path of receiving a strong signal. You can always move your antenna around to a different location and then just run coax cabling to the location where it enters your house. Based on your DirecTV satellite mount, you may be able to carefully remove the satellite dish and mount the HDTV antenna right on the DirecTV dish mount. 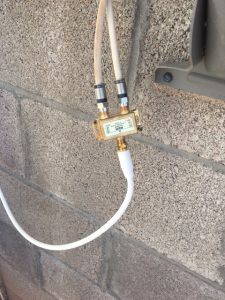 Now it is time to head to your DirecTV dish and inspect the coaxial connection that comes from the dish. My DirecTV system was using the Single Wire Switch or SWM technology so unfortunately, I can’t speak to any other DirecTV technologies. 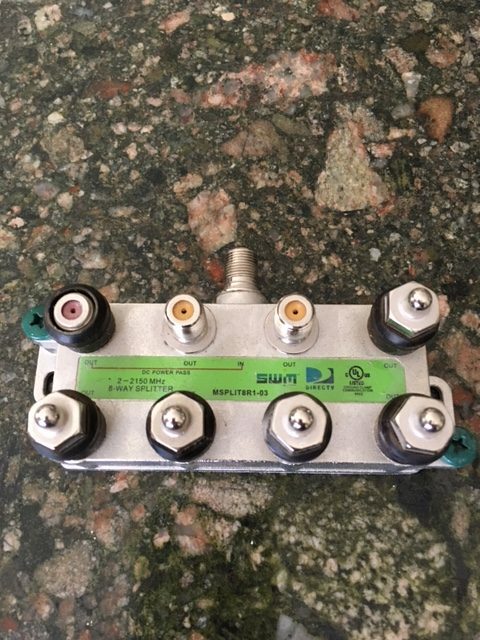 Here is a picture of the SWM adapter that was coming from the DirecTV dish, note that it looks very much like a cable splitter. 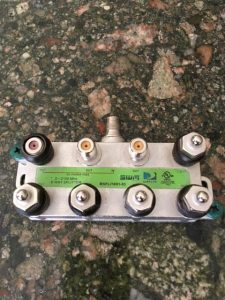 Note that this is a special SWM splitter from DirecTV and works only with a satellite signal. You will want to understand where the different cables are going to from this SWM adapter. In my case, they were going to another box that was an original Cox cable installation for the house. I was able to identify that there was a ground wire that was existing already so I’m good there but here’s another resource on ground wires if you want to do more research. I’m not an electrician and really didn’t want to mess much with what was already existing so I decided to just hook the antenna up to the existing cables to see what would happen and then I could diagnose any problems as they arise. Again, the house was already wired so in my mind all I’m doing here is just changing the source from satellite to antenna. I was worried about signal loss throughout the house since I have no idea where other splitters could exist and don’t have an idea of the existing wiring in the house either. This is probably common sense but worth noting that the signal is strongest the closer you are to the antenna and the least amount of splits in the line as well. My next step is to remove the DirecTV SMW adapter and replace it with my new Coaxial splitter. 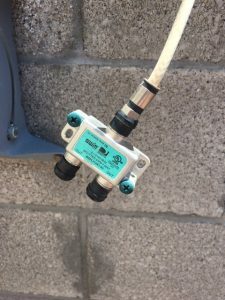 Use the coax cable from your HDTV antenna as the “in” source, and then use whatever cabling was attached to the “out” sources on your DirecTV SWM adapter as the “out” sources for the splitter. Once you have replaced the SWM adapter with the coaxial splitter then believe it or not but you’re almost done! Now that we have all of the connections completed, we need to see what comes in on your TV. I would recommend not starting with your family’s main TV but instead start with a TV in a spare room. The next step is to remove the DirecTV box from your TV. My TVs were all connected via HDMI cable, so I removed the HDMI plug from the back of the TV. Next, find the coaxial cable that runs from the wall outlet to the back of the DirecTV box and unscrew it from the DirecTV box. Once removed, find the cable connector on the back of your TV and screw the cable in. Ran the coaxial cable from the antenna to a new splitter. Then attached the coaxial cables from the SWM splitter to the new splitter. Press the Input button on the remote control and select “TV”. Select “Tuner” and press OK. Check the “Tuner Mode” settings. It should say “Cable”. If it says “Antenna” press the left arrow button on the remote to change it to “Cable”. Go to “Auto Channel Scan” and press the OK button on the remote. Your TV will then scan for channels based on the signal strength. When the progress bar reaches 100% you will have access to all of the TV channels your TV receives. Step 3: Watch free TV! Scroll through the local channels you want and watch each of them for a few minutes. You’ll want to watch and see if the signal comes in strong and steady. If not, you may need to go back to your antenna and adjust the direction it is pointing. I spent about 30 minutes calibrating the antenna based on the various signal strengths I was receiving. When you are satisfied that you’ve found all of the channels you’re going to get, repeat this process for every TV. I had one minor issue during my transition to HDTV. A TV in a bedroom was only getting half the channels that the others were getting. I thought it was a signal loss because this was our master bedroom and was the furthest point from the antenna. When the DirecTV installers were at our house we had them run coax to an outlet so we could have a TV on our patio. Turns out they spliced the cable in this bedroom and there was a SWM adapter on the line! As I mentioned before the SWM adapters are for satellite signal only and it wasn’t allowing the HDTV signal to pass through. I replaced the SWM splitter with a standard splitter and reprogrammed the TV and I had all of the other channels my other TVs were receiving. At this point, I don’t really think I have any signal loss from point of entry to the TV furthest away. SWM splitter that was attached to my bedroom TV. Once it was replaced with a regular splitter, the reception, and channel count both increased. After completing the transition over to OTA HDTV it seems to me that the picture quality is better than DirecTV. It could be wishful thinking but I honestly believe it to be the case. I also thought that this process would be much more difficult than it really is. I really wish we had done this sooner because we do not miss DirecTV. It is also worth mentioning that if you have a family member who has DirecTV, you can also utilize their login to be able to stream content from various apps like ESPN, FoxSportsGo, HBONow, etc. So in my experience with canceling DirecTV, they only wanted 3 of the 6 units I had back. I find this to be quite disingenuous since they have no problem charging me equipment charges every month, but I digress . . . . If they do not request back all of the equipment and you programmed your DirecTV remote to control your TV, you might as well keep the remote. No reason to return a universal remote since one of your TVs may need a new controller one day. The process to cancel with DirecTV was pretty simple. They sent me the postage paid boxes to return the equipment they wanted and they sent me a prepaid Visa debit card for the balance left on my account. If they tell you that you can just cancel when your month is up, just say no and ask for a refund. This helps pay for your antenna and any other equipment you had to purchase. 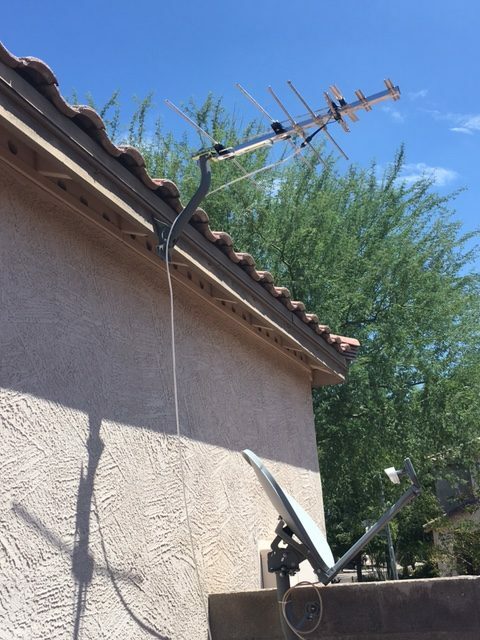 An antenna attached to my roof getting over 40 HDTV channels over-the-air. At the beginning of this tutorial, I had links to optional equipment if you want to add streaming to your TVs. We’ve been really happy with Roku devices as well as the Amazon Fire TV sticks. The way the current technology is, you will need a streaming device for every TV if you want to stream video. My math shows us way ahead over the next year even if we were to purchase a streaming device for every TV. We saved over $220 a month and over $2,400 a year by ending our relationship with DirecTV and installing an antenna. Please note that this tutorial was based on my specific setup. Please leave any comments or questions below.